1974 Andre Segovia Summer School in Santiago de Compostela. Jose Luis Rodrigo (front row centre right), Jose Tomas (front row centre left), Ken Burns (rear row). Image courtesy of Monash University Archives. Ensemble comprising Doug Brasier, John Garick, Brook Green and Phillip performing at a Sydney venue. 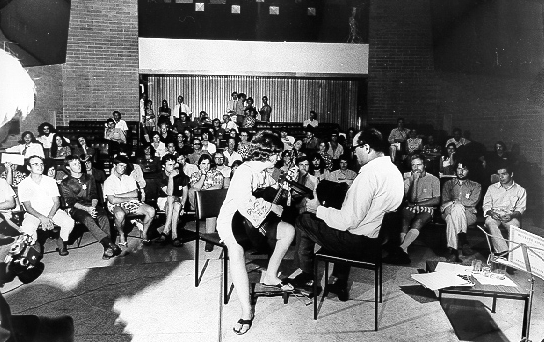 James and Ken performing a duet for James's final exams in the Batchelor of Music Performer's Degree at The University of NSW. Jose Luis Gonzales was a protege of Andre Segovia and Ken's first formal teacher.